Do you get Nigeria working again when all the ports in the entire Biafran region are deliberately closed down in order to emasculate the economy of Biafra? If the previous level was catastrophic, imagine what the next level would be. Do you propose a next level when the Eastern region is deliberately denied international airports just to discourage economic activities in Biafra? Do you speak about one-Nigeria when there’s a deliberate effort to ensure there’s no working rail line in Biafra? Do you get Nigeria working again when our people die on daily basis and goods worth billions destroyed because the roads are death traps? Surprisingly, some gullible ones who receive campaign T-shirts, caps, tomato pastes, and cups of rice have in their stupidity, gone to advocate for the election of these criminals under the same fraudulent system. Some have continued to blindly root for these betrayers and prodigal politicians who trade with our collective joy and destinies for their selfish political interests. These criminal politicians come up every electioneering period to make empty promises of restructuring, job creation, security, economic advancement etc. Let’s not be too quick to forget the empty campaign promise of 2015 by the late Buhari and the APC, of 5,000 Naira monthly stipend for the unemployed graduates but which was never fulfilled and which has been swept aside. But come February and March, we will all have the opportunity to prove to the world our resoluteness on the Biafran struggle. The day we must take a bold stand for our future and the future of our unborn children. As they say, a man is not measured by his stand in time of certainty but rather in time of uncertainty and discomfort. The time of discomfort is now which many people are in a dilemma, whether to choose referendum and eternal freedom or to choose a paltry sum of money which they will receive in their various polling units to jeopardize their future. Biafrans must remain resolute in this quest for Biafra by boycotting the fraudulent colonial Nigeria and its shambolic elections. This is because our tomorrow is assured if we stand boldly to defend Biafra today against all odds. 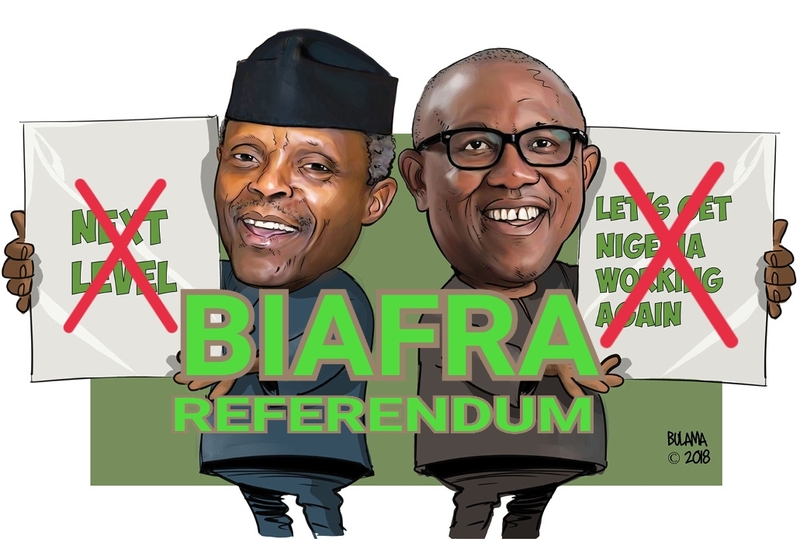 Biafra referendum and Biafran sovereignty is the only means of redemption and the ultimate solution to the mess that we have found ourselves in. Biafra is where our revolution will not only heal our collective misery and deprivation caused by the Nigerian state but will be a total revolution for the benefit of all citizens of Biafra and indeed those of the African continent. Biafra will not only bring the dividends of democracy – employment, security, upliftment etc but will be a land working for all citizens, both the leaders and the led. It will be a nation where politicians will not campaign with sachets of salt and empty promises during electioneering periods. If this is a chance we should give to anyone, it is a chance we must give ourselves to restore Biafra. It is an opportunity for our names to be written in Gold in Biafraland as that generation which stood its ground to demand for its rights. We must boycott Nigeria’s sham elections as it is a price to pay for our referendum and ultimately, freedom. We must boycott their deceptive tactics of using the prodigal son - Peter Obi, against the general wish of the people for freedom. We must boycott endless deceptive promises of restructuring which never comes. We must boycott deceptive promises of 2023 presidency. We must boycott the double-standards of our gullible politicians, who accept their divide-and-rule schemes of South-South and South-East introduced to further divide our people. 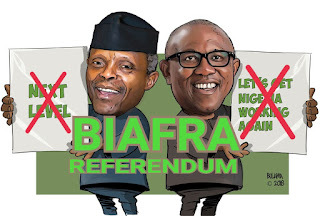 We are not just boycotting the Elections in the Islamic Republic of Nigeria because it has foreigners as its main Presidential candidates and because the system is entirely fraudulent, but because we have chosen Biafra over Nigeria in order to do away with the entire fraud which made it possible for such a shambolic system to ever exist.